Keeping in line with the theme of the month – Stick Fun, I decided to make 3 cards for Lil P’s teachers at school & day care (for Teacher’s day). I also wanted it to be easy enough for Lil P to be able to help out in the process. Here’s what we made. White Card stock paper cut into 12×6 Inch rectangle. 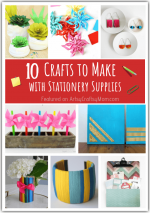 Fold the card stock paper to form a 6×6 inch square card. Cut the Green ribbon vertically halfway to form the grass. 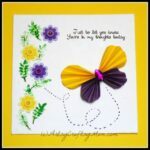 Cut 1 large circle & 1 small circle from 4 contrasting colored ribbons. I used Purple, Yellow, Blue and Orange. Paste as shown in the pic. Lil p did the entire pasting on her own. Paint the stem and leaves using a brush. We had so much fun that we ended up making 11 of the same.. 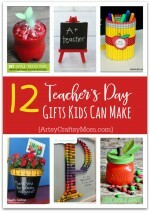 I plan to make another handmade gift for her teachers. Any suggestions??? 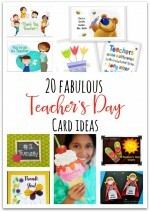 20 Awesome Teachers’ Day card Ideas with Free Printables! @swaram: LOL. Thank u 🙂 N ya, u shud do a husband song too! I will be nodding in agreement. 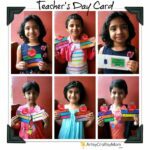 Lovely idea shruti…Even i am plannig to make something for aryan’s teachers…Can I use your idea and make this card for them? @Aryan’s Mom. of course!! 🙂 Go ahead n don’t forget to share the pics.